Last week, we enjoyed a week of celebrations as the College community celebrated the 40th anniversary of Northside Christian College. The week commenced on Monday with a special assembly at Encompass Church. 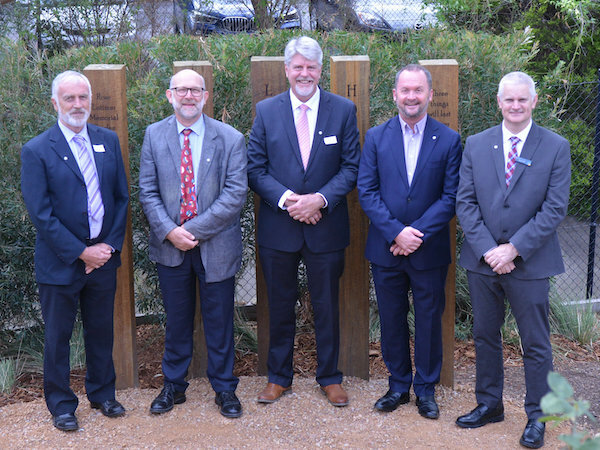 The College community enjoyed hearing interviews from each decade with Jack Robertson (Past Parent commencing in 1979), Ken Greenwood (Past Principal), Stephen Leslie (Past Principal) and Doug Holtam (Past Principal) sharing reflections. A special highlight of this event was the College singing happy birthday with Anna Venegas (former student and current staff member) and Charlize Venegas (current student) blowing out the candles and cutting the cake. The assembly was closed in prayer by the Committee of Management President, Pastor Mark Donato. On Tuesday, the College community started the day in prayer at a special Prayer at the Pole event, led by College Chaplain, Jared Stocks. This event provided an opportunity to give thanks to God and to continue to seek his blessings on the College community. This event was followed by the opening of a new water feature on the College grounds, opened in prayer by former College Chaplain, Jim Vaughn. The water feature was created by a staff member and current parent, Maryann Stewart. The College hosted a 40th Festival on Wednesday evening, which included displays of photos and memorabilia, food trucks, a jumping castle, face painting, and live music. The evening was attended by many past students and was a lovely opportunity for the broader College community to celebrate together. The evening concluded with a fireworks show, which was an exciting conclusion to the Festival. On Thursday evening, the College hosted a Staff and Parents vs Students Great Debate. The student team consisted of Jacob (Year 6), Isabelle (Year 9) and Dimi (Year 11). They debated against Mr Damian Higgins (College Principal), Mr Chris Gatt (staff member) and Dr Theresa Cole (current parent) on the topic "That robots should not replace teachers as humans." This was an entertaining event with the audience declaring the students the winner of this debate. The week of celebrations concluded with a ‘Back to the 70’s’ dress up day with students and staff dressing up in costumes and fashion reflective of the 1970s. This proved to be a fun way to conclude a special week and the last day of Term 1. The celebrations will continue later in the year when the College recognises the actual anniversary of the College’s registration. Many thanks to the staff, students, parents and the broader College community for assisting us in celebrating this milestone for Northside Christian College.